We’re continuing our new series, Sewn Stories, which is all about the garments or textiles that have meant the most in your life, either sewn by you or by someone else. Please join me in welcoming Barbara Niemann. She has been sewing since she was 9 years old and has been passionate about sewing since. With a recent move to Stratford, Ontario, she is currently in the process of fulfilling a dream and setting up a dressmaking shop offering services for garments and home décor. She is hoping Memory Garments will become a part of her business. Now I’ll hand it over to Barbara. This project was made from the heart. It is not just an upcycle, I would rather call it a Memory Garment. It has been a year since the passing of my father. A difficult year it was. One of the hard tasks was packing up his clothing for donation. 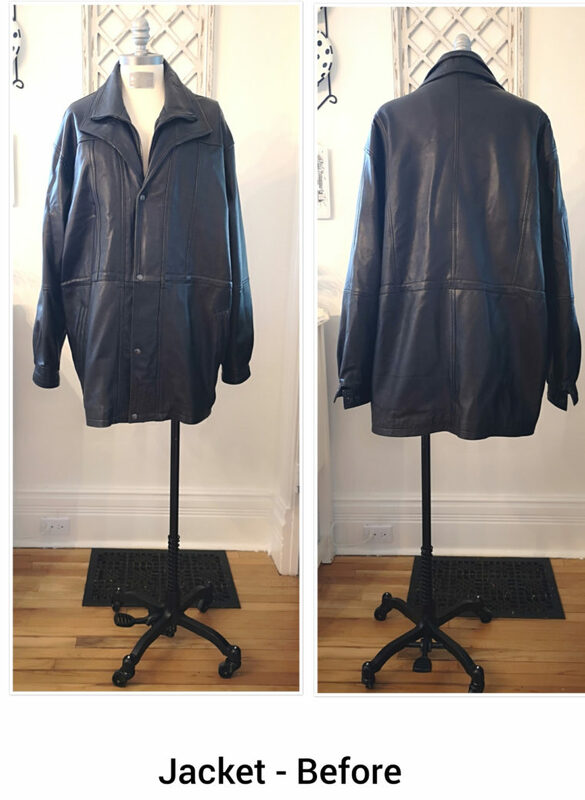 My mom and I decided to keep his favorite black leather jacket which he loved. After many months, I found it a shame to have it hanging in the corner of the closet. I decided to transform it into something my mom could wear, and at the same time she could feel close to him while wearing it. They were married for 64 years. The jacket was in excellent condition considering it is approximately 25 years old. Dad really looked after this jacket. My parents immigrated to Canada in the early 1950s from Europe. They worked hard and took care of everything they accumulated. Recycling was a way of life. Nothing was thrown away; it was repaired or repurposed. Mom spent many hours sewing outfits for us and taught me how to sew at a very young age. I loved going to the fabric shop with her. Fast forward half a century, although she doesn’t sew anymore she will occasionally come with me to the fabric shop. We have kept her 1950s Pfaff sewing machine, just in case. It still works, of course it does! I considered altering the jacket to fit her, but knew it would still look like a men’s jacket, and of course the closure would be on the wrong side. I decided to transform it into a coat. Scouring many coat patterns I chose Lisette for Butterick B6385. I loved the flattering A-Line shape which I knew would work well. The jacket was a men’s 2XL. Mom is close to a size 12 in sewing pattern charts. The first step was to take the jacket apart, piece by piece, (that was tough, what if I ruined it?!). This enabled me to see what I had to work with. I purchased faux suede to help piece the coat together. 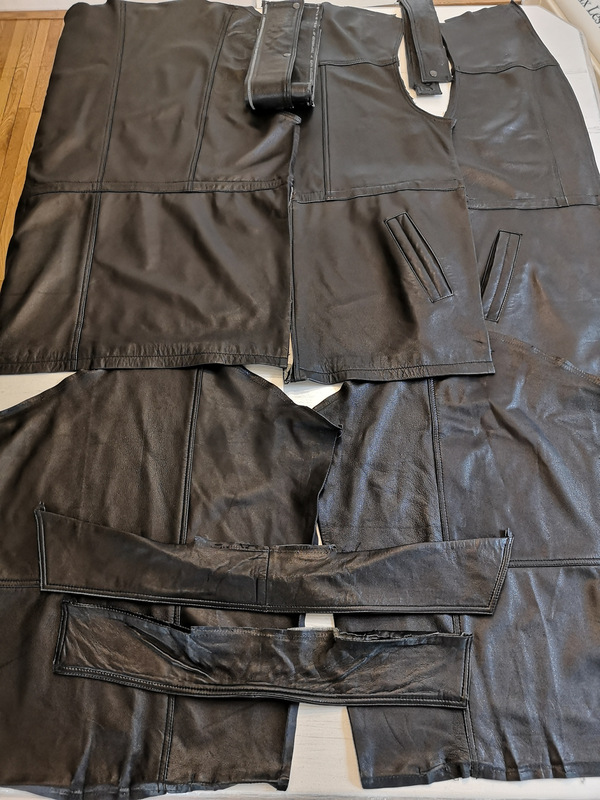 I had enough leather for the front sides, back sides, upper sleeves and collar. I was also able to use one of the double collars (with modifications) and the snap tab closure as concealed plackets (flipped upside down so it would close on the correct side). There was a lot of planning and modifications along the way. 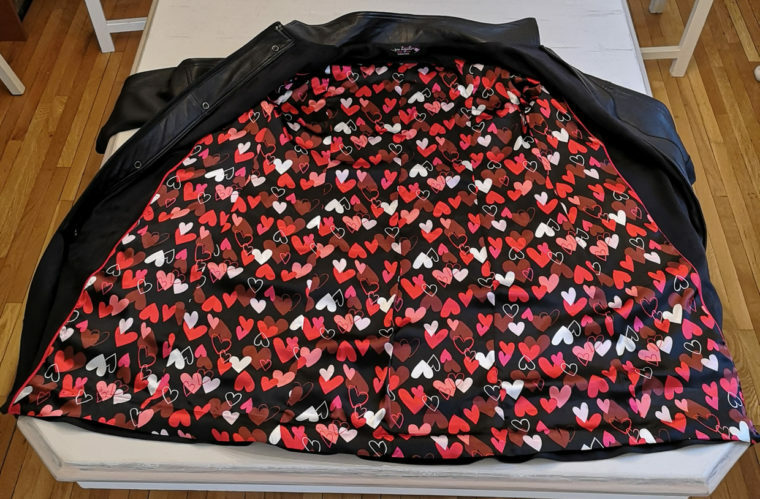 I found a heart patterned satin for the lining which was perfect! I had an ample amount of lining and used it for the muslin. Luckily only a few alternations were required and I was able to continue on. Piping was used for inserting the lining in the coat. 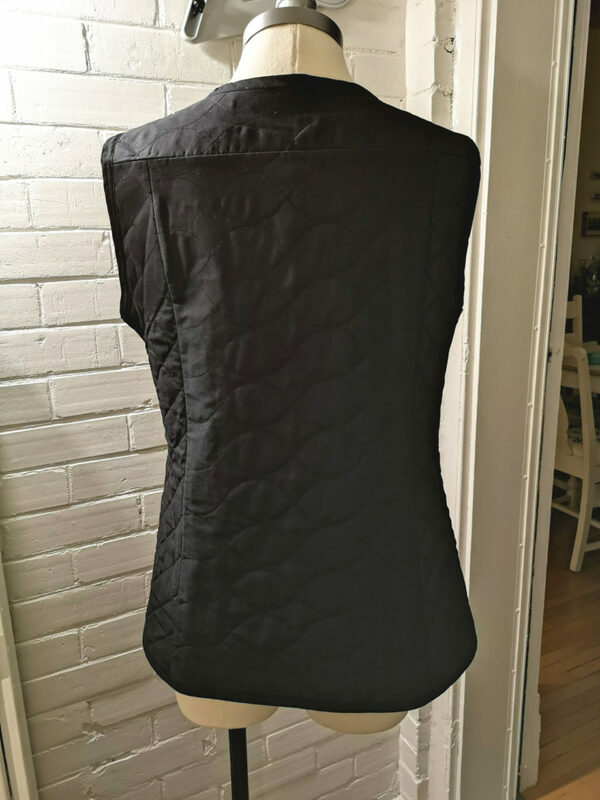 I also made a quilted vest which I inserted between the lining and the coat for extra warmth. This project was a challenge and I was a wreck with fear of ruining it and ending up with a pile of cut up pieces. It was very difficult working on this project and remembering my dad wearing the jacket. No doubt tears came easily. In the end, I know he would be so happy to see her wearing her coat. Mom loves her coat and prefers wearing the collar standing. She will be 93 this year! I look forward to seeing her wear it for many years. “No doubt the tears came easily.” Well, yeah, me too! That was a beautiful story and required a Kleenex or two. Lovely job with the coat! Firstly, your mother is beautiful. I cannot believe her age. And your coat is a work of art and love. You have so much talent and love, you do not need luck in your dream endeavor. Wonderful adaptation and your Mom looks beautiful in it! Bravo to both of you! I am awed by your talent, energy and expertise. Your mother is a beauty. What a touching story! And amazing craftsmanship. Thank you for sharing. This made my day and made me cry. What a work of love. Thank you so much for sharing. What a lovely story! And her mom looks great in the good! And not 93!!!! What a lovely “memory” project, brings tears to my eyes also. Best wishes with your sewing shop – it has the perfect name!! Thank you for that beautiful story. Such a lovely piece of work to remake for your mom. She must love it. This is just so perfect. My mother (who would have been 94 this year) died a few months after my father. I’ve kept a few of her garments but she was so tiny and nothing would ever fit my sister or me. However, I have retained my father’s wool suit jackets and I think—thanks to you!— that I shall try repurposing them for me. Thank you so much for telling this story and showing us what you did. I was so moved when I saw this project on Sewing Pattern Review (and “dobbed you in” to Liesl :), and to read even more about it here is a delight. It’s a wonderful project both in conception and execution. You, and your mum, should feel very proud! I am so impressed! Your mother looks very elegant in your creation. Thanks for inspiring us!! You made a fashionable coat for a beautiful lady. It is a well-done tribute to a much-loved man. That is gorgeous and what a labor of love. Beautiful. What a beautiful story and what a wonderful daughter. How happy your mum must be wearing her precious memories. I love this story and what you have created. I can’t imagine a better way to keep the memories alive. Beautiful transformation and lovely story. What a wonderful memory and gift to your mother. Wow, this is amazing! What beautiful work, and what a lovely, meaningful story. When my grandmother passed away, my mother, aunt, and cousins were tasked with the job of going through her clothing. Nearly all of it was donated after we had our turn hugging it and sharing memories of her wearing it! I snagged a few random pieces and made my mother and aunt each a tote bag of duck cloth, lined with one of GG’s shirts. One of my cousin’s daughters got a makeup bag from a pajama pant leg 🙂 and all of my mother’s grandkids got a quilt from my mother that year, with a scrap of GG fabric somewhere a part of it. I love these little reminders and it’s a meaningful way to keep her close, still. Hugs to you and your mom! Thank you for sharing your story! Beautiful coat…..a true labor of love❣️ You mother is beautiful, too…..she belies her age! What a beautiful story, what a beautiful mother and what a beautiful leather coat. Thank you for sharing.